With his infectious energy and charisma, Gok Wan has an incredible gift of making women feel more confident within themselves - but it's not until you read his own inspirational story that you find out where he got that gift from. Gok grew up on a Leicester housing estate, with a loving family who ran a Chinese restaurant. For his parents, food meant love - and Gok was so well loved that by the time he was a teenager he weighed 21 stone. Being Asian and gay as well, Gok felt lonely and out of place. He was an easy target for bullies and suffered terribly at their hands. In a moment of inspiration, he decided to reinvent himself with his first style makeover and a larger-than-life personality to go with it. But his next move was to lose a devastating ten stone in nine months. In "Through Thick and Thin", for the first time, Gok reveals all about that life changing period. The lessons Gok learnt during this time helped him bounce back to become a stylist to the stars, every woman's best friend and a national treasure. In this intimate memoir Gok tells his full story in his own words. 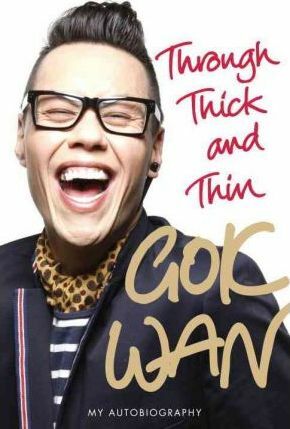 Whether he's recounting the horrors of childhood bullying or riotous anecdotes about his loving family, behind the scenes in the fashion world or TV shows, Gok's voice jumps off the page with all the honesty, wit and warmth we've come to know and love him for. Gok Wan was born in 1974 to a Chinese father and English mother. He grew up on a Leicester housing estate before becoming one of Britain's leading stylists. He dominates the Channel 4 schedules with no less than three shows: How to Look Good Naked, Gok's Fashion Fix and Miss Naked Beauty, has published three bestselling style guides to go with them.